Mice are notably cool for doing more than singing, a talent described in last Friday’s blog post (Mice Songsters). For sure they can be pests and carry disease. But they’re cute, smart, entertaining and have been kept as pets for at least a thousand years, even worshiped. Today’s addendum gets into mice basics and beyond. Mice aren’t rats, though they’re both rodents (order Rodentia). 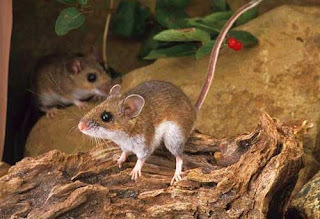 There are hundreds of different types of mice, divided into subfamilies of Old or New World species. 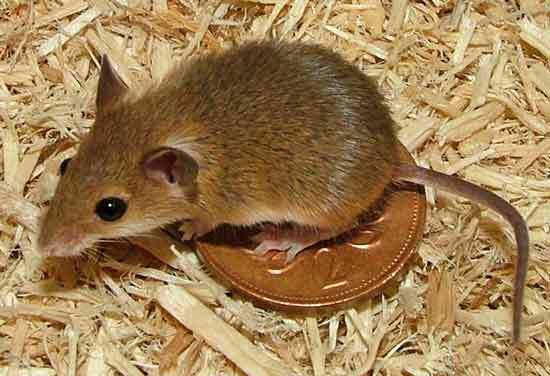 Common varieties include deer mouse, house mouse, field mouse and dormouse. Mice are nocturnal creatures found in nearly every country and type of terrain. In the wild, mice typically live in underground burrows. long, not counting the tail. 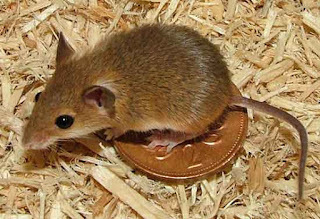 Not counting their tail, which might be as long as their bodies, adult mice range from about 1 inch to 7 inches long, depending on the species. Most weigh half an ounce to an ounce. Mice generally live from 1 to 2.5 years; if cared for, pet mice might live, say, 6 years. 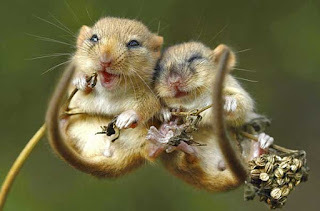 Mice like fruits and grains but are omnivorous and will eat 15 to 20 times a day. Male mice are referred to as bucks, females as does, baby mice as pinkies, pups or kittens, and a group of mice as a mischief, horde or nest. Mice are clean, tidy and organized. Within their underground burrows, they set aside specific areas for food, nesting and relieving themselves. 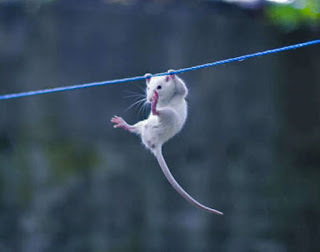 Mice can traverse thin rope or wire, climb rough vertical surfaces; jump up 18 inches and jump down or fall 12 feet without injury. They also swim well if it’s unavoidable. Mice can use their whiskers to detect changes in temperature and terrain. Mice seldom travel more than 20 feet from their nest. Their trails are easily spotted because they use same route. Mice are extremely social and talkative, communicating with sounds we can hear as well as with ultrasonic sounds discussed in the Friday blog post. Female mice can mate and reproduce when they are as young as 4 to 7 weeks old. Gestation is 19 to 21 days and litters are 4 to 12 babies. They may have a new litter every 3 weeks. An adult mouse's heart beats on the order of 600 times per minute, which is about 6 to 10 times faster than ours. When really frightened by something, mice will play dead until they perceive the danger has passed. 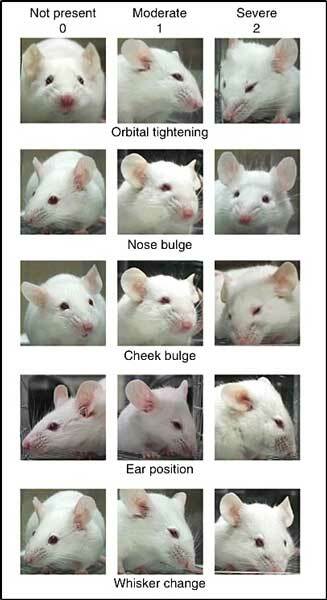 Mice exhibit facial expressions for pain and in aggressive and fearful contexts. A mouse shows empathy for a familiar mouse’s physical pain. Ancient Greeks saw mice as a symbol of prophetic power. Apollo is represented on coins with a mouse in his hands or at his feet. 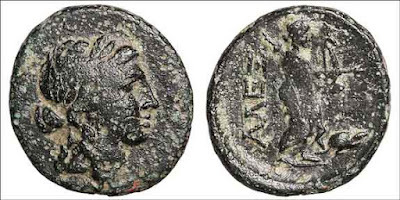 There was reported to be a statue of Apollo with a mouse under its foot in the temple of Apollo at Chryse, an island in the Aegean Sea.